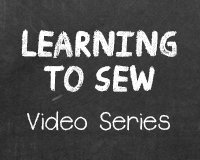 polyester fiberfill | Do-It-Yourself Advice Blog. In yesterday’s post, we outlined 4 Important Foam Terms to Know and how those attributes are important to different foam applications. Now that you can talk about foam’s properties and features like a pro, it’s time to take a look at specific types of foam and which of those features they bring to the table. When choosing foam for your next outdoor project, be sure to consider your application and determine which properties are most important for the environment your cushion will live in. This is not actually foam, but rather densified polyester batting that creates an effective foam alternative. Compressed polyester will not disintegrate or yellow like traditional foam, but it will compress over time. An example of this is Nu-foam Compressed Polyester, which is mildew resistant and non-allergenic. Nu-foam is washable, and will easily air dry after getting wet. This foam alternative is an inexpensive option and is best used for occasional seating, like patio cushions. 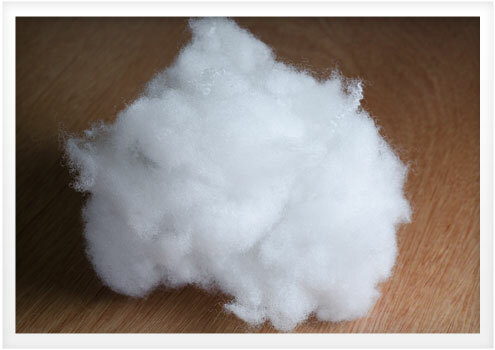 Like Compressed Polyester, Polyester Fiberfill is not truly foam, but rather blown polyester fibers. An affordable option, it is a common stuffing for pillows and deep seating back cushions. Generally, Polyester Fiberfill is stuffed inside a pre-sewn cover of Spun Bonded Pillow Protector Fabric, which is then inserted into the cushion or pillow fabric to give support and shape. Fiberfill is non-allergenic, and resistant to mildew. It is machine washable, but the fiber can bunch up in laundering. Use your hand to smooth it back out. 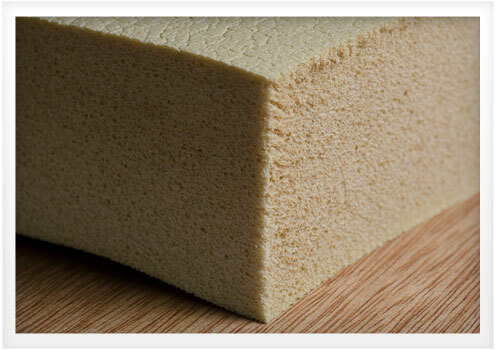 A more traditional foam option that often contains a biocide treatment, Polyurethane foam is affordable, has a medium firmness, and is suitable for seating and mattress applications. If polyurethane foam gets wet, the cells will soak up the water. The biocide treatment is important because it prevents mold and mildew growth that can occur when wet foam dries out. It is a good idea to use polyurethane foam in locations where it won’t get wet or to wrap the foam in plastic before inserting it into the fabric. 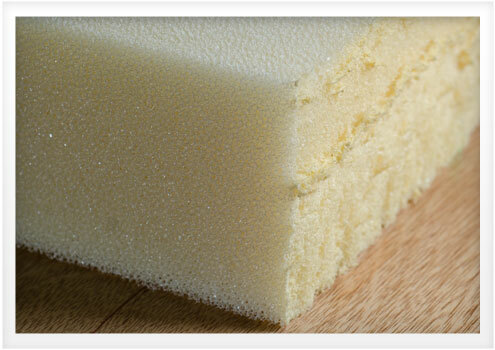 Brands of polyurethane foam include Reflex and Sailrite’s Anti-Microbial Polyurethane Foam. 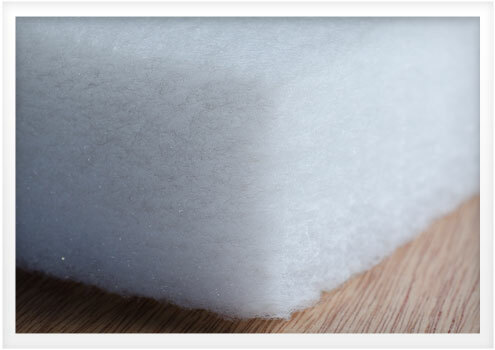 Reflex foam is the most common marine cushion foam. An open cell reticulated foam has open pores that allow water and air to flow through easily. Open Cell foams make a comfortable and cool seating cushion or mattress. Dry Fast is a high quality open cell foam. Dry Fast foam is formulated with an antimicrobial agent to prevent mold and mildew. It is a more expensive foam, but you get what you pay for. When paired with an outdoor cushion fabric or Phifertex Mesh, open cell foam creates a virtually maintenance free cushion in sun, rain, and snow. Dry Fast is a popular, user-friendly open cell foam. Due to its popularity, there are knock-off versions on the market. To see if your foam is high quality Dry Fast foam, pour a cup of water on it. The water should run straight through the foam and drain out the bottom. If the water runs off the sides of the foam, this is an imitation Dry Fast foam. Also known as floatation foam, Closed Cell foam does not allow water to run through, making it buoyant. 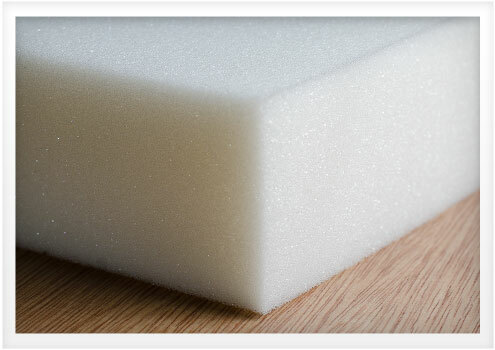 This foam is made from PVN and is 3 times firmer than Polyurethane foam. It is also a more expensive option. Closed cell foam is great for flotation applications like floating cockpit cushions and life vests. It is also a good choice for commercial boat seating, or other seating that will be used as a step for getting on and off the vessel. This foam has no water absorption, so you can safely cover it with any type of fabric. Thin sheets of closed cell foam are often glued to the bottom of other foam, adding additional support for the cushion, like a box spring to a mattress. When used with Dry Fast Foam, cut holes in the closed cell foam for drainage. As you can see, there are a lot of foam options out there so it should be no problem to find one that is just right for your next project. Check back tomorrow for the third and final installment in the foam series, Anatomy of an Outdoor Cushion, to see how to wrap and protect the foam inside the cushion.